In many facets of our lives – from cell phones to television – there has been a shift from analog to digital technology. It’s no surprise that two way radios have also made the switch, taking communication to a whole new level. Options for radio users have opened up opportunities for product choice based on team member needs. No longer is there a ‘one-size-fits-all’ two way radio. This is especially true with Motorola’s MOTOTRBO™ line of digital two way radios. The lineup of radio options within MOTOTRBO™ has a model for every industry, every budget, every employee, and every size. This means whether you’re an executive wanting to stay connected to employees, or you work in a hospitality environment and need a small compact two way radio, there are many options. In the tougher industries, such as manufacturing and oil and gas, the most durable options can be found in the MOTOTRBO™ portfolio. But MOTOTRBO™ is more than just two way radios. In fact, it’s more than voice communication. MOTOTRBO™ has a number of features that provide users with an enhanced experience – from connecting with other devices such as tablets, cell phones, and computers, to GPS tracking capabilities, work order ticket management, text messaging, and data applications. No longer is location a factor with the right two way radio system – whether you’re communicating within a single building facility, or across provincial lines, it’s possible with MOTOTRBO™. All-in-all, MOTOTRBO™ has become a resource for organizations to thrive with the technology their teams require. The result? A drive in efficiency, productivity, and safety. But, as mentioned above, there are a variety of radios to choose from. If you’re considering a fully functioning two way radio system from MOTOTRBO™, there are infrastructure requirements to make that happen. Depending on your needs within the MOTOTRBO™ system, there are a number of infrastructure capabilities that take your communication to a new level. Before talking about the infrastructure options, it’s important to know and understand the terms within them. Simplex – As it sounds, simplex radio systems are simple, they are programmed with a frequency issued by Industry Canada, and sends information in one direction at a time. This type of communication separates the need for repeater stations. Conventional – This is the most basic of radio systems available to users. Users within conventional radio systems operate on fixed, pre-determined channel and frequency, which they remain permanently assigned to during use. If a radio user has multiple channels, they are operating on one channel at a time. Conventional two way radio systems can also be used with a repeater to improve coverage. Trunked – Within a trunked radio system (also known as a multi-site trunking system), which has grown in popularity among public safety users (read about the NBTMR and TMR2 projects, for example) there are a number of frequencies allocated to the system for communication. This pool of various channel options is available for many users, among different groups. In other words, trunked radio systems take into account that at any given time, with a number of users using radio units, a larger number of users can be accommodated. Also, within that model, individual talk-groups can be assigned within the trunked window – allowing teams to carry on conversations, without interfering with progress among others. There are a number of MOTOTRBO™ systems to choose from that may fit the needs of your organization – depending on the size, coverage area, and the number of sites required. Whether using data applications within your two way radio or requiring single-site and wide area coverage, there is no longer a one-size-fits-all option in radio systems, either. Let’s take a look! Capacity Max – Site management is key with team communication, and Capacity Max as part of your digital two way radio system enables support of up to 250 sites and around 3,000 users per site. If you’ve got teams with large capacity, but require communication among those teams, then this is an option to consider. Built with high performance in mind, and with you having complete control of your systems, Capacity Max enables the instant communication you require to drive productivity, efficiency, safety and above all else high-level team communications among your facilities. Linked Capacity Plus – Within the MOTOTRBO™ solution portfolio, there may be a need or desire to communicate across a large area or field of coverage, while keeping that solution easy-to-use, and cost effective. With the advanced technology built into the Linked Capacity Plus option, both single and wide-area coverage is possible. These are often ideal options for utilities, school districts and public safety, and companies that fall under the transportation umbrella. Capacity Plus – Built for single site trunking systems, Capacity Plus by Motorola takes MOTOTRBO™ just a bit further than the use of just two way radios within your organization. Useable with up to 1,000 radios within a network, enabling teams big and small to benefit, instant voice and data communication happens with Capacity Plus. Connect Plus – Built for trunked radio systems within the MOTOTRBO™ line, Connect Plus allows for a single or multi-site digital system that accommodates a number of high volume radios and wide areas – capable of not only connecting conversations but data applications for efficiency throughout your workday. IP Site Connect – If you’re not getting the coverage you want from your digital MOTOTRBO™ system, many customers have found success with the IP Site Connect option – which uses the internet source to extend areas of coverage. The added advantage of this resource is it’s available anywhere – with no limits if locations are dispersed across a city, province or country. Users are able to automatically roam from one area of coverage to another with no intervention – providing the voice and data capabilities you’d expect with this type of investment. So what is required to make this happen? As we said above, infrastructure is the key to making these types of systems work. That infrastructure requirement is made up of a number of different facets that ensure you’re getting the most from your MOTOTRBO™ digital radio system. Controllers – Built for larger trunked radio systems, like those on Connect Plus, controllers are used to manage and authorize access for users on the system, and ensure that both the traffic and talk paths are open for communication among teams. Base Antennas and Coax – Base antennas are a key to two way radio communication, and simply mean those that are attached to a tower, building or type of infrastructure. Coax cable is used within two way radio technology to ensure the communication you desire with your MOTOTRBO™ system is what you get. Also known as coaxial cable, there are a number of brands to use that suit this need. Repeater and Tower Location – A repeater and tower combination are what ensures that when you hit the button on your two way radio, or want to use an application, you can do so successfully. Without proper repeater and tower locations, your systems can suffer. The location of both the repeater and tower for your two way radio system is based on the area of coverage you are looking to achieve. An RF engineer, like those at Nova Communications, are often used to determine the best locations based on those requirements. SLR5700 – This is one of Nova’s most popular repeater option for your MOTOTRBO™ system, mainly due to its sleek form and low infrastructure cost. Built for both voice and data and capable for use with Capacity Plus, Linked Capacity Plus or Connect Plus Systems. Also available with IP Site Connect. SLR8000 – Built for both single site conventional radio communication and high-level trunking systems of the Capacity Plus, Capacity Max and Connect Plus, the SLR8000 repeater is a high-performance option at a cost effective price. Known for its power, and its easy-to-use technology, the SLR8000 can meet your communication needs in various capacities. Duplexers and Multicoupling – Simply put, this is how repeaters connect to antennas to optimize your MOTOTRBO™ two way radio experience. A duplexer allows antennas to both transmit (TX) and receive (RX) at the same time with one repeater and one antenna options. With multi-coupling, there are many repeaters and frequencies to connect, which is often used on bigger systems with multiple users on multiple sites. Industry Canada – A two way radio license is acquired through Industry Canada – the federal board in charge of approving license requests. Their organization ensures you are using your two way radio system safely – without interfering with other businesses, public safety systems, or even aircraft that may be working in the same area as your system. This license request process can take up to seven weeks to complete. As part of our professional services here at Nova Communications, we have a team of RF Engineers that can determine the best requirements for your systems in the application, and better answer the complicated questions involved in the licensing process. Alarm & Telemetry – If you’re looking to enhance safety, MOTOTRBO™ provides a variety of the alarm and telemetry options. Including worker safety features such as alarms for situational awareness in the workplace. Within the telemetry field, there are options to track various equipment and sensors within your work environment, and fix them or make changes to your two way radio. Options such as turning lights off or on remotely, monitoring irrigation controls or opening and closing programmed doors, the alarm and telemetry feature enables you to monitor your workplace from afar. Broadband and LMR Voice – Allowing your two way radio to be more than just a two way radio, with the right broadband and LMR voice, customers are able to make and receive phone calls from their radio, while also having access to familiar features of their phones. Device and System Management – System monitoring is an important asset for efficient workflows. Ensure your network is performing as expected with the right applications for your MOTOTRBO™ system. Interoperability – If you’re looking for options to combine both your analog and digital two way radio systems, then interoperability is the way to go. Most Popular: VT-TRBO-PP by Scholer-Johnson Inc. Integrated Command and Control – These applications once again speak to safety in the workplace and enable responses to be made quickly and effectively if an incident in your organization occurs. Most Popular: SCOUT by Avtec, Inc. / TRBOnet Plus by Neocom Software / neoConnex Fleet Manager by Neoterra Systems Inc.
Situational Awareness and Workforce Efficiency Management – While these are options MOTOTRBO™ users are looking for, the facets within are often built into other applications listed above. System Monitoring Applications – You want to get the best out of your MOTOTRBO™ system and to do so, you need to know that it’s performing the way you need it to. With the right applications, you can see everything from metrics to usage logs which allow you to plan how to best use the technology. Console Applications – These applications provide MOTOTRBO™ network users with the ability to monitor their technology with fully integrated dispatch control and console management. Whether it’s recording or team monitoring, each offers their own advantages. Wave on Cloud – This is the option that connects users together on various devices. From mobile phones, computers or tablets, two way radios and more, Wave on Cloud by Motorola enables your team to do everything efficiently to get the job done. Options include instant push-to-talk (PTT), texting and location tracking to name a few – all from the device of your choosing – and all from the location of your choosing. XPR3000e Series (XPR3300e and XPR3500e) – Known as a cost effective solution for those looking for a high-end two way radio. It has been used in manufacturing, emergency services, construction, security and beyond. 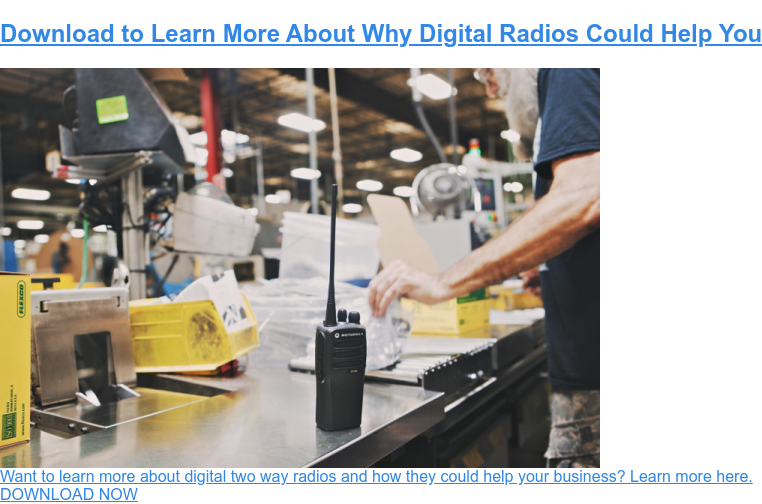 If you’re looking for what MOTOTRBO™ digital radios can do for you, this is a great start. Features include an IP67 rating (dust proof and waterproof up to three feet for 30 minutes), safety features like Lone Worker, a compact and lightweight shell, analog and digital capability, along with automatic background noise adjustment with the Intelligent Audio feature. XPR7000e Series (XPR7350e and XPR7550e) – Made for some of Canada’s toughest industries, the Motorola XPR7000e series is built to ensure you stay connected with your team in your work environment and has been used in manufacturing, oil and gas, public safety and more. Features include up to 29 hours of battery life, better range and audio clarity than you’ve known with your radio, Bluetooth capability and dustproof and waterproof ratings at IP68. SL7000e Series (SL7550e) – Sleek, thin and portable, but built with some of the features users love about MOTOTRBO™, the SL7000e series is ideal for customer facing industries like hospitality, property management, and retail, but has also proven itself in manufacturing and education. Approximately the size of a smartphone, the SL7000e features include a full display with easy-to-read information, integrated WiFi and Bluetooth, location tracking applications, work order ticketing, and background noise reduction for optimal communication. XPR5000e Series (XPR5350e and XPR5550e) – Being a radio user on the move shouldn’t mean you have to compromise on the features that you enjoy about MOTOTRBO™. Fantastic for industries that need to stay connected to other MOTOTRBO™ radios within the fleet (even if it’s not the same model), including manufacturing, warehousing, transportation and more. Features include integrated WiFi and Bluetooth, location tracking and high-level durability. SL300 – Popular for industries such as hospitality, manufacturing, property management and retail/warehousing, the Motorola SL300 is compact but rugged and durable for the daily expectations of Canadian industries. Features include analog and digital capabilities, ultra-slim design for easy use, up to 15 hours in battery life and a shatterproof display for those inevitable drops. CP200d – One of our most popular sellers, the easy-to-use Motorola CP200D is ideal for everything from construction, manufacturing, volunteer fire, security, warehousing, and so much more. Features include analog and digital capabilities, up to 18 hours of battery power, high-level durability and a smaller size for easy carrying throughout the day. CM200d – Great for compact use in a mobile two way radio, the CM200d has seen great success in construction, agriculture, forestry, and transportation. If you’re not ready to upgrade to digital, this mobile will work in analog until you’re ready to transition. Features include an easy-to-read display and compatibility with other MOTOTRBO™ radios in your fleet. CM300d – Built for users on the move in everything from emergency services, manufacturing or transportation, the Motorola CM300d is available in both a standard or high power form. Features include a bright display for easy reading behind the wheel, analog and digital capabilities, and compliance abilities with a number of Canada’s distracted driving regulations. Earpieces – A number of team members have seen the benefit of earpieces with their two way radio, especially with its ability to keep employees in touch, and work to continue, without interrupting those around you. With various types of earpieces within the IMPRES line, there are options for everyone. Batteries – There are three quick benefits to IMPRES batteries, which explain why two way radio users continue to use them in their fleet. Firstly, they do not overcharge, which is a common issue with two way radios. Secondly, they’re known to last longer due to a reconditioning sequence that happens when they are being charged. And thirdly, often times two way radio batteries overheat, which can diminish their life span. That is not a concern with IMPRES batteries. Speaker Mics – IMPRES audio accessories enable team members to hear the message the first time, and this is included in speaker mics for your team. With a variety of mics to choose from, there is something for everyone to ensure the job gets done. Multi-Unit Chargers (gang chargers) – If you have a large two way radio fleet, a gang charger or multi-unit charger, enables quick turnaround and charging for multiple radios at once (up to six). The value of IMPRES chargers is, when charging IMPRES batteries, there is no concern for overheating or overcharging like a number of other radio batteries. Keep in mind, these accessories are capable for use with both digital and analog modes of MOTOTRBO™ two way radios. Construction – The cost of construction is going up, as is the cost of materials. But, with increased pressure from the customer, companies need to take steps to remain competitive. MOTOTRBO™ two way radios have done that with options like trunking, enabling large groups on site to be accommodated for communication. Other benefits include systems for teams to communicate across sites, or even cities, with IP Site Connect, for example, and integrated voice and data for immediate results. MOTOTRBO™ radios are built for tough jobs, but with easy-to-use technology to make a construction site run smoothly. Education and Healthcare – The key in healthcare and education environments is for everyone (patients, families, staff members, students etc.) to remain safe, while employees stay efficient. MOTOTRBO™ enables supervisors to manage requirements and emergencies swiftly, providing a professional and safe environment as a result. With the real-time communication available in every corner of the facility, patient and student safety are able to remain a top priority. A further benefit of MOTOTRBO™ is private, always available communication – because when you need to communicate, there is no time to waste. Supply Chain Industries (Transportation, Manufacturing, and Warehousing) – Today’s consumer has more demands than ever, especially when it comes to goods and services. But, how are you supposed to speed up the process? MOTOTRBO™ has been known to increase efficiencies, which leads to less downtime, quicker turnaround, better results, and satisfied customers. Clear voice and data enable managers and team members to get answers immediately, fleet tracking is of utmost importance, and with almost 70% of freight moved today by trucks, immediate results need to occur. With the right solution, teams can connect their two way radio to whatever device they need to get the job done – from cell phones, laptops, computers and more, saving the need for multiple devices. Automated processes in manufacturing and warehousing are no longer a thing of the future. When these steps are in place, the manufacturing and warehousing industries are best able to respond to consumer needs. MOTOTRBO™ answers that call with industry-leading applications built for fast-paced environments, including work order ticket management, location tracking, and real-time network monitoring. And, when paired with the right accessories, efficiency is a driving force that makes you standout from your competitors. Oil and Gas – With features like Man Down and Lone Worker, managers and supervisors will never miss a beat when an employee needs them. But the benefits don’t end there. Noise levels are a thing of the past with automatic background noise reduction, high-level visibility of the job site, along with real-time communication enabling quotas to be met. Hospitality and Property Management – From the hotel lobby to the restaurant or retail floor, and even when managing building complexes, hospitality and property management can benefit from MOTOTRBO™ radios. Address needs quickly, deal with maintenance before others realize it’s an issue, and discreetly handle security incidents. With the right system in place, work order tickets can be issued and assigned to individual users, and your property is differentiated from your competitors. Government and Emergency Services – A number of government and emergency services have seen the benefits from the capabilities of MOTOTRBO™ in their work environment. Whether it’s public safety and the need for both private, secure networks, with the ability to track teams to ensure they are safe, to wide area coverage that allows for communication on the other side of a building, town, city or even county, MOTOTRBO™ has you covered. When you work in government and emergency services, seconds count, and information needs to be shared quickly across networks and teams. No matter your industry, or your need, MOTOTRBO™ has the option to improve your team’s communication. There’s also an understanding that not every person in your workplace requires the same tools to get the job done effectively. With the array of options available within the MOTOTRBO™ line, there is something for everyone. The end result is simple – a more efficient, productive and safe workforce.